Some other words we see that mean the same thing as witness include, bystander, observer, spectator and testimony  (or testifier). Being a false witness is equivalent to being a liar. In the Bible we see examples of what it means to be a true and/or false witness. 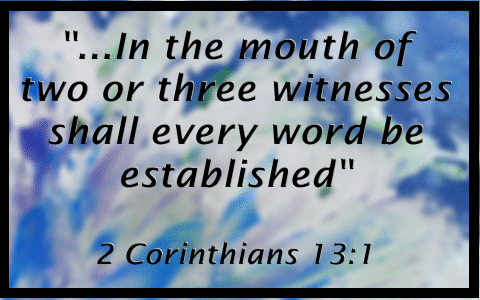 Here is what the Bible says about being a witness. Luke 1:1–4 FORASMUCH as many have taken in hand to set forth in order a declaration of those things which are most surely believed among us, Even as they delivered them unto us, which from the beginning were eyewitnesses, and ministers of the word; It seemed good to me also, having had perfect understanding of all things from the very first, to write unto thee in order, most excellent Theophilus, That thou mightest know the certainty of those things, wherein thou hast been instructed. Luke 24:46–48 And said unto them, Thus it is written, and thus it behoved Christ to suffer, and to rise from the dead the third day: And that repentance and remission of sins should be preached in his name among all nations, beginning at Jerusalem. And ye are witnesses of these things. Matthew 28:12–15 And when they were assembled with the elders, and had taken counsel, they gave large money unto the soldiers, Saying, Say ye, His disciples came by night, and stole him away while we slept. And if this come to the governor’s ears, we will persuade him, and secure you. So they took the money, and did as they were taught: and this saying is commonly reported among the Jews until this day. Mark 14:55–56 And the chief priests and all the council sought for witness against Jesus to put him to death; and found none. For many bare false witness against him, but their witness agreed not together. Acts 17:6–7 And when they found them not, they drew Jason and certain brethren unto the rulers of the city, crying, These that have turned the world upside down are come hither also; Whom Jason hath received: and these all do contrary to the decrees of Caesar, saying that there is another king, one Jesus. We should be always looking for opportunities to give a true testimony of things that happen. Sometimes it is to help in the process of justice that we are a good and true witness. Sometimes it is to give our own personal testimony of how we came to know Jesus . Even so, many are tempted to give false witness against others. For this reason, the Bible also speaks of the need to have two or three witnesses in the matter (Deuteronomy 17:6; 1 Timothy 5:19, Hebrews 10:28). Sometimes we just need more than one witness to get to the truth of the matter.